If this Olympic Games leaves us with any legacy, let it be that the phrase 'podium pants' now enters the lexicon. The Irish brothers Gary and Paul O'Donovan might have only taken home the silver medal, but they've become global stars thanks to the hilarious interviews they've been giving after their event in Rio, from going into unnecessary detail about the process of giving urine samples, to expressing their disappointment about not being back at the pub at home in Skibbereen. In fact, most of my favourite moments at the Olympic Games this year have been from 'losers' — presuming you can really apply that label to anyone who's reached the elite level of a global sport. Australian runner Ella Nelson was informed in a live TV interview that she'd missed out on qualifying for the 200m final by 0.1 of a second. You can see the disappointment flash across her face in the video but then moments later she recovers as she takes in the whole moment. These moments provide a fascinating contrast to the columns that have been appearing in the media following what has been a disappointing Olympics in terms of medals success. Australia appears likely to fall well short of its pre-games medal target of 13 gold medals, with many of its more fancied contenders failing to live up to the high public expectations. In fact, Australia looks like not even reaching its medal total for the London Olympics (35 medals), which was the country's worst performance in 20 years. Apart from the women's rugby sevens and the men's basketball team, Australia's performances in team sports have been disastrous, with teams in rugby, hockey, basketball and soccer dropping out in early rounds. Swimmers and cyclists and other athletes who had previously had success in world championships have failed to win medals. "How inspired does a local butcher get when they see the little kid who used to come into the shop with her parents competing in the judo tournament? How do you put a financial price on these outcomes?" Criticisms have been raised about the government's Winning Edge funding strategy, which has seen money poured into elite sports where Australia has traditionally been most successful or where medals seemed most likely. It has seen increased funding directed into 14 Olympic sports, including basketball, cycling, diving and shooting. While the mercenary response to our games efforts is an inevitable consequence of our approach to funding mostly those with a chance of achieving medals, it doesn't necessarily have much to do with what people actually get out of watching or being part of the Olympics. There's another factor in the equation, a human factor, that's a lot harder to put a monetary value on and a lot harder to measure. How much of a lift to the spirit does a school get when it watches one of its recent graduates compete in the track cycling against the best in the world? How inspired does a local butcher get when they see the little kid who used to come into the shop with her parents competing in the judo tournament? How proud do Ella Nelson's parents and friends feel about the way she conducted herself after her event? How do you put a financial price on these outcomes? I'm not saying that, in a limited funding picture, there shouldn't be some consideration given to directing so much money to elite sport over grassroots competitions. I'm also happy to concede that we can be just as inspired by the stories and examples of overseas athletes as we can be by Australians. I'm just wondering if perhaps this focus on value for our investment has somewhat overshadowed the deeper value of having Australians striving to be part of this gathering of the world's greatest athletes. As so many of the 'losers' at the Olympics have shown, in the grace and humour of their responses to failure, it's not winning that makes a person great. Indeed, a few of the winners at this games haven't acted like great people outside the competitive arena. What draws people to a person, what will make them cheer for that person even when they've fallen down and injured themselves and all that's left is to stumble across the line, is that we see something of ourselves in their efforts. Their small victories are our small victories. If we're going to review where we direct our Olympic funding, perhaps we should look less at those people who are the best chance for medals, and more at those people who are most likely to inspire us with their efforts. Even if that's a lot more difficult to measure. Proud of cousin Scott Bowden for his achievement getting to Rio and taking part in mountain bike racing. The world's a big place and we're part of it. Usually, I watch the Olympics with rapt attention. Not this time though, and not due to lack of interest but circumstance. Australia, per capita, has produced many great sports people This is a personal assessment but Don Bradman and Rod Laver spring to mind as sportsmen who were world-best and achieved that due, primarily, to great love for their sport and skills honed by dedication springing from that love. Temperament is always a key factor in sporting success and I like to think that, even if great success had not come their way, they would have been happy playing their sport on a Saturday arvo at the local cricket ground or tennis courts. Money cannot buy that. Congrats. to all athletes who competed at Rio and enjoy the fact you got there! The human body is a wonderful creation. What joy and admiration it inspires when we see it strive to jump higher, run faster, be stronger! And what a thrill it is to see men and women in the spirit of honest contest spur one another on in their striving. But - there is always a 'but' where human affairs are concerned - what happens when this contest is commercialised, politicised, becomes a platform for vainglory and chauvinism? In the Rio games there were humble winners, gallant losers and a few ne'er-do-wells (even if they did win gold medals. But for me a highlight was the way the Fiji Rugby Sevens team knelt on the winners podium to receive their gold medals. And in their interviews unashamedly, indeed quite without pretence, thanked God, their coach, and their families for their success. In such a moment the spirit that blows life into the body was made manifest. Bula Bula Fiji! So glad to see your use of apostrophes whenever you discussed winners and losers. Really all are 'winners' and 'losers.' A 'winner' can only be so because other competitors of elite standard in their event competed against them. As you quite rightly suggest these athletes are Olympians: the best their country could send having met qualifying times/ distances etc. Let us never forget that. I liked the example you chose of an athlete missing out by 1/100th of a second. Really? I would apply the same thinking to someone who misses gold by that margin too. Sometimes a frenzied media get it so wrong. I must admit I did not follow the Olympics very much at all this time but I was so happy for the athletes who had the chance to complete against the world's best-hopefully without having to complete against those who had the assistance of doping. 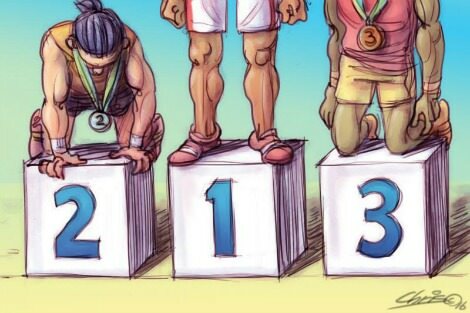 What really irritates me very much is the idiotic people- so called experts who claim from their easy chairs that we failed to win our rightful quota of medals . I'd like to see them have a go ! Good on our boys and girls , you should be proud that you actually got to Rio, that is a reward in its own right. Firstly the Olympics are games. However the integrity of the organization its accountability and performance defy rational assessment. The whole system si scammed to excess. Secondly if you are always going to fund on the measurable outcomes, as the article suggests, you will have to look for numbers. At least in this accountancy led world. Often the numbers are the worst indicator or criterion. Thirdly if you want success you ought fund the media. They make so much of the play. Fourthly why not fund more deserving causes? I like sport and have been brought up in a very sporty family. I like the Olympics, but not the expectations many have or the massive over funding we give to its preparation. I think sports people should be charged and have HECS as other students do. I want the money more fairly distributed, so more money on the ground level, so all Australians can benefit from sporting skills. I don't care about medals, but love good sporting behaviour. Almost all public conversation quickly turns to transgressors. Olympic competitors growled about proven and suspect drug users. Many wanted people found to have used drugs shamed and shunned. This insistence that transgressors should definitively lose their good name and the right to participate is not confined to sport. If inflexibility and exclusion become the rule in dealing with aberrant speech or behaviour we find unacceptable, they will impose heavy burdens on individuals and society.